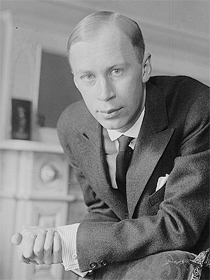 Sergei Prokofiev (1891-1953) was born in a small village in Russian Ukraine, the son of an agricultural engineer originally from Moscow. Beginning the study of piano at age three, he began to compose at six and produced his first opera when he was all of eight years old. He enrolled at the St. Petersburg Conservatory in 1904, and continued his studies for several years, quickly drawing acclaim. Following the Russian Revolution in 1917, he relocated briefly to the United States. It was there in 1919, that he composed his Overture on Hebrew Themes for a group of fellow Russian émigrés. These were the musicians of the Zimro Ensemble, Russian Jewish musicians then on a world concert tour to support the cause of establishing a conservatory in Jerusalem. Prokofiev was initially reluctant to write a piece based on material that was not his own, but warmed to the idea when he began extemporising on a collection of Jewish tunes that Bellison had given to him. The Overture was an instant success. Prokofiev expanded the scoring for full orchestra and the work has never left the repertoire. He left the United States for Paris in 1922, and returned to the Soviet Union for good in 1932, where he remained for the rest of his life. The next years produced Lieutenant Kijé, Romeo and Juliet, War and Peace and Cinderella. In his homeland he was celebrated and honored until the 1948 crackdown on Soviet composers by the Central Committee under Stalin’s orders. He died in 1953, on the same day as Joseph Stalin.